This morning, the Greater Toronto CivicAction Alliance, or CivicAction for short, launched its “What Would You Do With 32?” campaign. They have a video with all sorts of folks musing on how they would spend all the extra time they would have if the full Big Move plan were implemented. Very nice, very charming, very misleading, very wrong. Getting. Around. Town. Can. Take. An. Eternity. But it doesn’t have to. It can be so much better. At the press conference, that number troubled me because I didn’t remember seeing such a calculation anywhere in the background papers to Metrolinx’ The Big Move. It turns out that this number is not a saving relative to today’s trips, but a comparison of our future, 25 years out, in Big Move or “do nothing” scenarios. What’s so important about the number 32? Anyone who thinks there commute will be 32 minutes shorter than it is today is dreaming. For comparatively short commutes, a 32 minute saving is physically impossible unless Metrolinx has an unannounced program to teleport us around the city. (Given Queen’s Park’s track record on transit technology, I wouldn’t be too keen on trying it out, although I can think of some guinea pigs who surely won’t be missed. The concept of a short-turn does not bear consideration.) Even for long commutes (over 90 minutes), a 32 minute saving is a substantial chunk of a trip, and it won’t be made over every segment. The biggest problem for transit riders is not the “rapid” part of their trip today (subway or GO train) but it getting to and from the rapid line at both ends. These parts of the trip don’t lend themselves to big reductions in travel time. We might extend a subway to Vaughan, but unless you live in a condo on top of the station, you still have to get to it. Many transit trips are all surface because even with The Big Move, they will not lie along rapid transit corridors and going out of the way (as an expressway driver would) to use them would be counterproductive. The Big Move (and associated funding schemes) don’t address this problem and leave local municipalities to find the funds, if they are willing, to boost what are seen as feeder services to the subway, not as vital lines in their own right. Yesterday’s discussion at Toronto’s Executive Committee included the important observation that people need to feel they are getting something concrete in return for a new tax they might pay. Civic Action’s campaign has two phases — one to talk about what might be, and one to talk about how we might pay for it. The fundamental problem, however, is that they are selling those “32 minutes” that don’t really exist. Most commute times will not get 32 minutes shorter. Don’t forget that’s an average, and so even greater savings are obviously forecast for some travellers while others will get little. I am not sure of the arithmetic validity of these claims. It’s noteworthy that the Metrolinx models were not capacity constrained and they forecast ridership on some routes like the main TTC subway lines well in excess of their actual capacity. That translates into full trains and pass-ups, something riders know today, never mind 25 years in the future. A missed train is extra wait time, but I suspect the Metrolinx model does not allow for this problem. 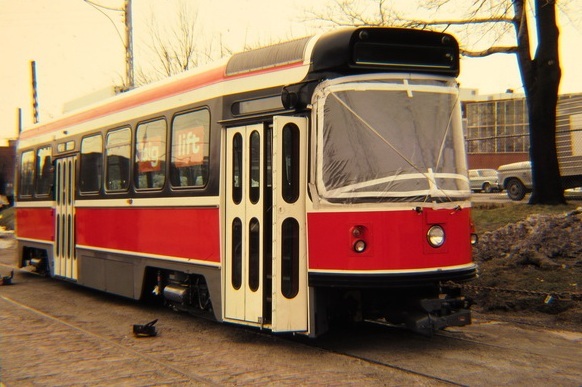 As for the TTC, there are limits on how many trains and riders can be stuffed into the existing system, and few of the updates needed to handle more riders (even if we assume they are practical) are part of The Big Move. The basic problem with the “Your 32” campaign is that it tries to find something to sell — those 32 minutes — because it cannot talk about specifics of what network and services we might actually see. Metrolinx’ plans are years old now, and there are already components that must be added to make the whole package work. Among these are the proposed Union Station West (for additional capacity and operational flexibility), GO electrification (a prerequisite for very frequent service) and the Downtown Relief Line (with expanded reach and an earlier implementation date to make both Union West and the Richmond Hill subway practical). Metrolinx has been hinting at an updated Big Move for some time. One was expected this fall, but they now expect to release a “technical update” in Spring 2013, and there is no sense of how much this update will address. We must hope that, at least, the 2013 plan contains all of the projects that the new Investment Strategy will fund, and that we won’t have an “oops” where a major component such as electrification is missing from the list. Also still missing is a worked example of putting the many components of The Big Move through a prioritization scheme. That process will inevitably set off a noisy political debate as people discover that their pet projects are now at the back of the queue (if they are still in the mix at all), and that major spending on new transportation capacity is decades away in some areas. How badly will the transit map be gerrymandered to convince taxpayers and politicians throughout the GTA that they should buy into a region-wide funding scheme? If we could raise $3-billion in new annual revenue, some of this would have to go to operations and to municipal transit systems, and it will be a quarter-century or more before the whole plan is completed. One might ask the boffins at Queen’s Park whether the construction industry can even burn through capital at that rate given their concerns about the constructability of Transit City on a compressed timeframe. John Tory, the chair of CivicAction’s board, spoke not just of traffic congestion but of leadership congestion. This begs the obvious question of Mayor Rob Ford and his supporters. At some point, “transit leadership” must include some blunt words about Ford’s views on transit and on funding. Partnerships with the private sector might work, although there are no guarantees and transit riders (not to mention taxpayers) will be left holding the bag if these deals fall apart. To his credit, Tory did not treat these partnerships as a source of free money, and talked of the need to pay back investments made by the private sector one way or another. CivicAction recruited a council of over 40 “regional champions” for their cause. What, exactly, they will do is still a bit vague, although one might hope they would organize outreach at the local level. You too can become a “local champion” and take the message to your community. This all has a rather amateurish feel to it, but I may be pleasantly surprised. Much will depend on the resources available to these champions including clear answers from government agencies about the transportation schemes and revenue tools they are promoting. A recent poll showed that 90% of GTA residents don’t even know about The Big Move, and if they don’t know about the plan in general, they certainly don’t know what it might (or might not) do for them. Getting new revenue such as a regional sales tax will be an uphill battle if people see this as just another tax grab. When and if CivicAction gets down to the task of explaining The Big Move, they will discover just how hard finding those phantom 32 minutes will be, and this could further undermine its credibility. The potential revenue from new taxes and fees are well-documented, most recently in the City’s report, and the City consultations will focus on the money side of things. “Your 32” might have been a nice idea in a different context, but I fear CivicAction fails on two counts. First, the underlying premise is wrong, and there is no way to sugar-coat that statement. It’s not a question of interpretation, but of misrepresentation. Second, the real debate will focus on raising money for major expansion of transit, and this demands concrete answers about what we would actually build and what the benefits of various network components will be. CivicAction depends on Metrolinx for this sort of information, and that agency remains silent on the details. Advocacy by local municipalities and by CivicAction is hamstrung because there is no way to know what the provincial priorities might be. Will The Big Move will be treated as little more than a bag of election goodies to dribble out as Queen’s Park sees fit? 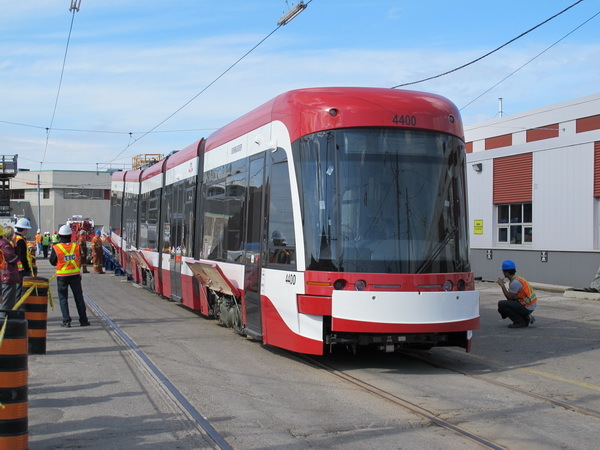 Toronto’s Executive Committee considered a report on transit funding mechanisms today. In the following report, I have included only the most interesting or important of comments to give the flavour of the debate. The proceedings were rather odd in that a presentation, cued up for City Staff, was never heard, but a “private citizen” managed to give a half-hour long deputation thanks to many friendly questions from Committee members. That “citizen” was Dr. Gordon Chong, former head of Toronto Transit Infrastructure Limited, an all-but-bankrupt subsidiary of the TTC used to conduct a study of the Sheppard East subway extension for Mayor Ford. A “glaring omission” from the collection of transit plans in the staff report, Chong said, was his own Sheppard report and the information produced by KPMG about tax increment financing (TIF). Chong clearly implied that the report was biased, but missed the fact that the Council motion directed the inclusion of “approved” plans for review, something Chong’s most emphatically was not. As for TIF, it is mentioned, but rejected as a funding mechanism as staff argue that such revenue is needed for general support of city services and should not be earmarked just for transit capital projects. Councillor Michael Thompson pursued the scheme of a Scarborough subway with a BD extension that would loop back along Sheppard to close the loop at Don Mills Station. Chong replied that if Toronto could deal with the “money issue”, then there is no reason we can’t have the best in transit. Thompson observed that a casino might bring in $75-100m annually and could fund transit projects. The oddity here is that both treat any new money as a bonanza to be used for the best possible transit (where they want it) when fiscal conservatives might be expected to argue for careful husbanding of whatever loot might come their way. There is also the small problem that the municipal share of projected revenue for a Toronto casino is probably an order of magnitude lower than the Councillor’s claim. Various Councillors mused about a regional agency to dispense transit dollars and decide which projects should be built. An underlying assumption was that, of course, the network of suburban Toronto subways would rank high on the list, and nobody seemed to contemplate that a 905-dominated agency might have other more pressing needs or think that the investment in all those subways was of dubious value. Chong had only veiled contempt for the “expert panel” who reviewed his report and recommended, instead, for the LRT option on Sheppard. He strongly supports subway construction presuming the money is available, supported by the best possible feeder bus network. Councillor Norm Kelly asked whether the LRT plan was “an aberration”, and Chong replied that all previous TTC Chief General Managers had supported subways. Although he invoked the name of David Gunn, he neglected to mention that Gunn boycotted the opening ceremonies of the Sheppard line. Mr reaction to the announcement yesterday that TTC would remain as “operator” of the LRT lines is on the Torontoist website. Although the TTC sees this as a “good news” story, I am less impressed because Toronto is still very much the junior partner. We get to drive the trains, and that’s about all. 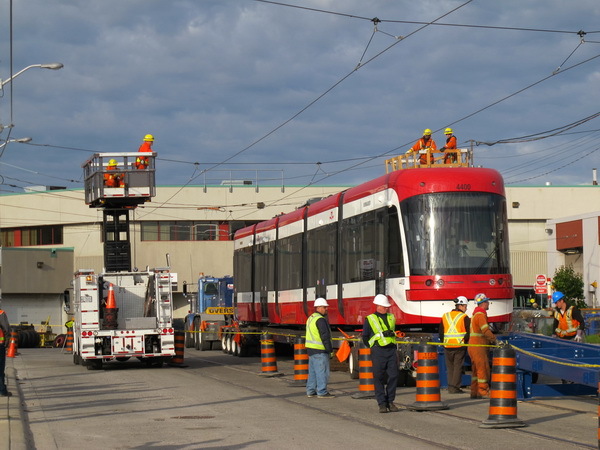 With all maintenance remaining in the hands of Metrolinx private partner, whoever that will eventually be, this is a big step in outsourcing transit operations. 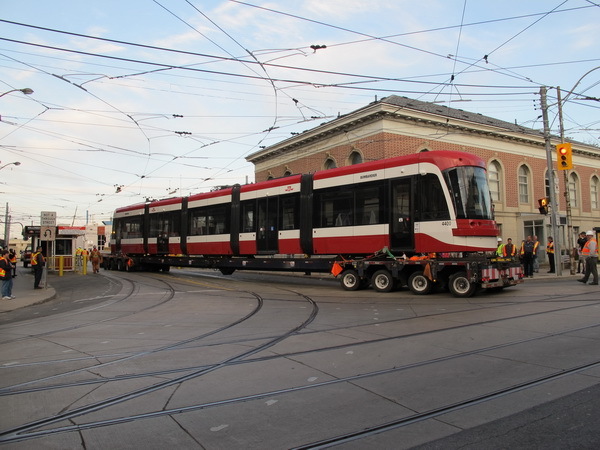 The Toronto Star reports that discussions continue between Metrolinx, the City of Toronto and the TTC regarding the possible operation of the planned LRT lines by the TTC rather than a private contractor. 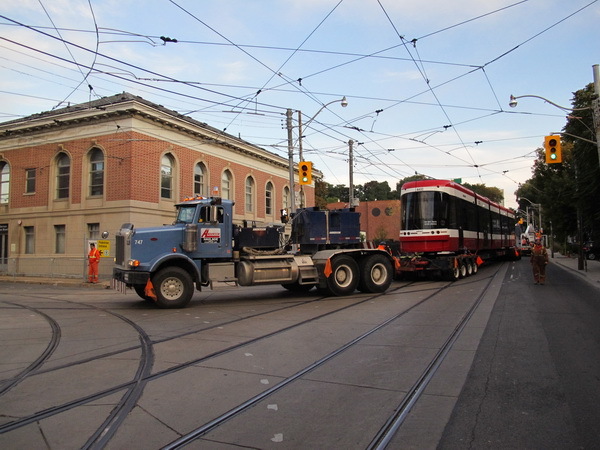 Exactly how much “operation” would entail is not mentioned, although the TTC is known to be concerned about responsibility for safety-sensitive systems such as vehicle, signal and track maintenance. A related issue is the amount of detail that must be worked out before a master contract is let by Infrastructure Ontario. If the private work ends when operation begins (with possible exceptions such as building and station maintenance), then this is a much simpler contract to draft than one that would require all of the details of future operations to be bundled with a design and construction contract. Whether Queen’s Park and Metrolinx are aware of or care about the delay inherent in needing to specify so much detail so far in advance for a single contract remains to be seen. My thoughts on recent announcements that Metrolinx would completely take over the LRT projects formerly part of Transit City are in an article on the Torontoist website. Thanks to Harold McMann for the following photos of 4400 arriving at Hillcrest. Thanks to Mike Filey for this photo of 4400. 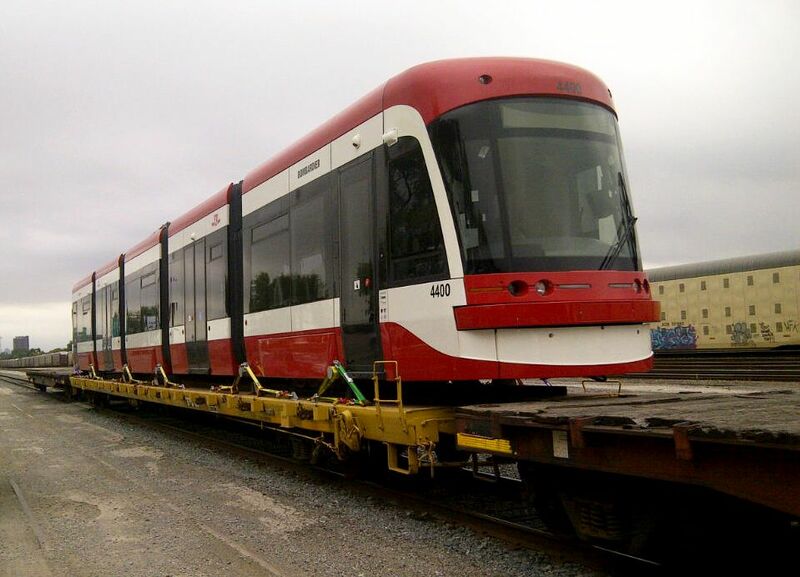 The Junctioneer reports that the first of the prototype low floor LRVs is in CPR Lambton Yard. The car is expected to move to Hillcrest in the early hours of Saturday, September 29. A media event will be scheduled for October. Thanks to all who forwarded me this link. See also the Torontoist and Randy Risling on Twitter. 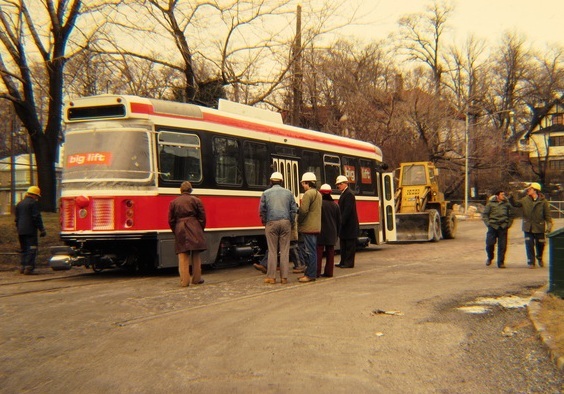 Note that the car has both a trolley pole and a pantograph.